Local governments went bankrupt trying to provide relief to jobless families and protests across the state grew increasingly militant. Organized labor grew enormously in strength and influence in the 1930s and helped mobilize legislative support for the minimum wage, worker’s compensation, and unemployment insurance. The lure of wartime jobs brought over 18,000 African Americans to Connecticut. In 1947, the legislature outlawed hiring discrimination, but fairness in education and housing remained elusive. African Americans settled almost exclusively in the cities, while government subsidies enabled newly returned white G.I.s to migrate to the suburbs by the thousands. 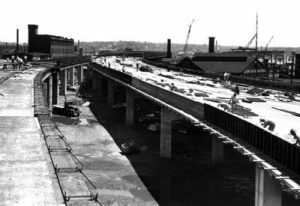 Limited-access highways, such as the Connecticut Turnpike and the Wilbur Cross Parkway, helped propel the suburbanization that was transforming the state. The legislature provided significant school construction funding to keep up with the post-war “baby boom.” The legislature also assisted with school operating expenses. Distribution formulas decidedly favored suburban towns. Governor Grasso‘s two terms saw the legislature pass improved utilities regulations, mass transit initiatives and a tightened administration of state agencies. 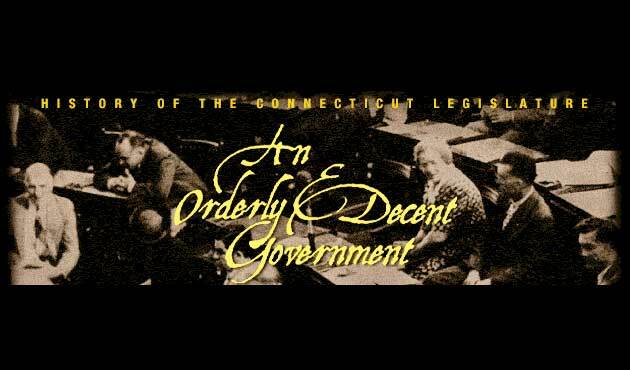 Her status as Connecticut’s first woman governor underscored the growing power and political leverage of women.